Strawberry season came early to Ohio this year and the berries are gorgeous! It's a perfect year to make jam. Homemade jam to me is all about the fruit and preserving it's fresh and delicate flavor. The preserves I like are not overly sweet or unnaturally thick from added pectin. 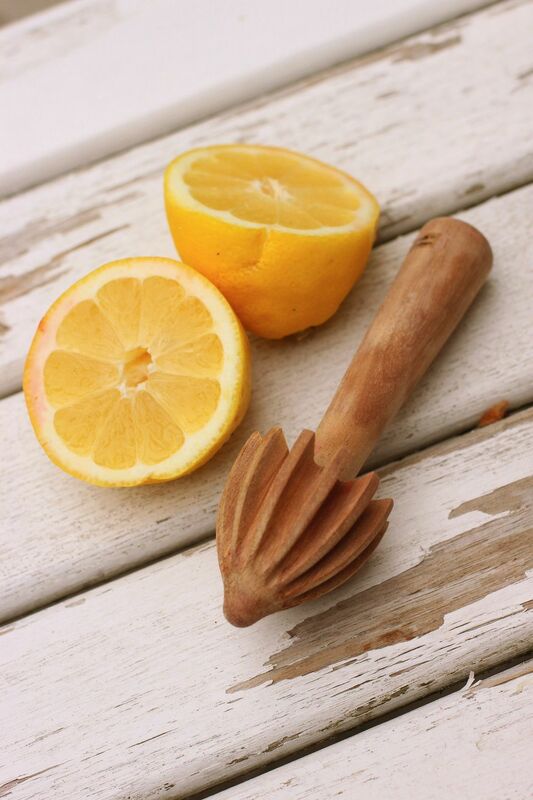 I try and keep it simple by using only a few ingredients: fruit, sugar, and lemon juice. Occasionally I'll throw in an herb or spice for added flavor. This season I've chosen to add lavender, and couldn't be happier with the results! Lavender imparted not only a lovely floral note to the strawberries, but also a beautiful hue. The way that I make jam has changed over the years, and I owe much of that to Blue Chair Jam Cookbook . No more sterilizing jars and lids in boiling water or processing the finished product in a hot water bath. Their procedure is clean and simple and has made my job much more pleasant. First I clean my canning jars and lids in the dishwasher and allow them to dry. Then they are placed onto a baking sheet and into a preheated 250F oven for at least 30 minutes. Remove them a few minutes before filling, so that they are not too hot to handle. It goes without saying that the best jam begins with the freshest fruit. These strawberries came from my local farmer's market. You will need a large preserving pan with a capacity of 11-12 quarts. Ideally it should be wide with 5" sides and made of copper or stainless steel. Never use aluminum, as it reacts badly with the acid in the fruit. I finally broke down and purchased this French Mauviel M'Passion Copper Preserving Pan last year. It was a splurge or an investment depending on how you look at it, but I don't regret buying it. It's a wonderful pan that I've used many times now and I love the look of it. A heatproof spatula is an essential tool in making jam. They are inexpensive and can be purchased at Williams-Sonoma and Sur La Table. 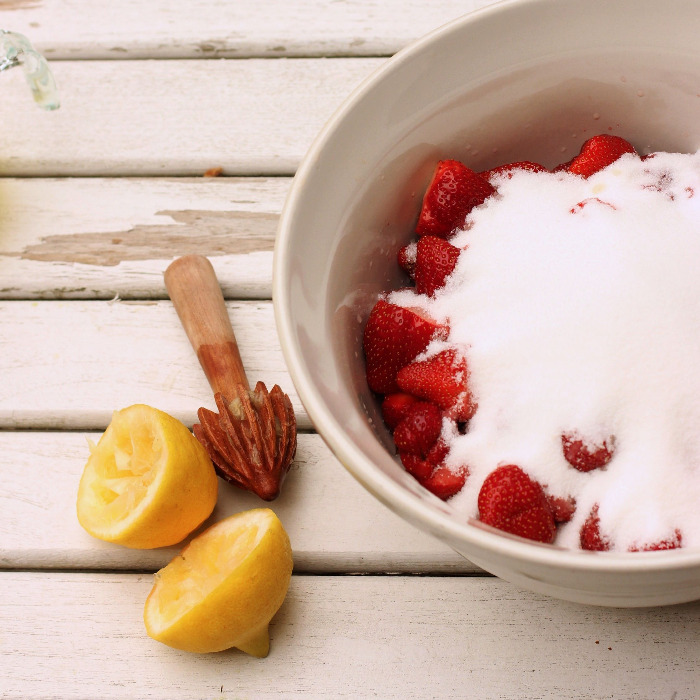 Begin by washing the strawberries and removing their stems. Put them into a non-reactive bowl with the sugar and lemon juice. Next day, transfer to the preserving pan. The strawberries will have released much of their juice. Place a saucer with 5 metal teaspoons into the freezer. You will use them later to test the thickness of the jam. Culinary Lavender is what I added to the strawberries. It was purchased at my local Penzeys Spices store but they don't offer it online. Frenchy Bee has it online here. 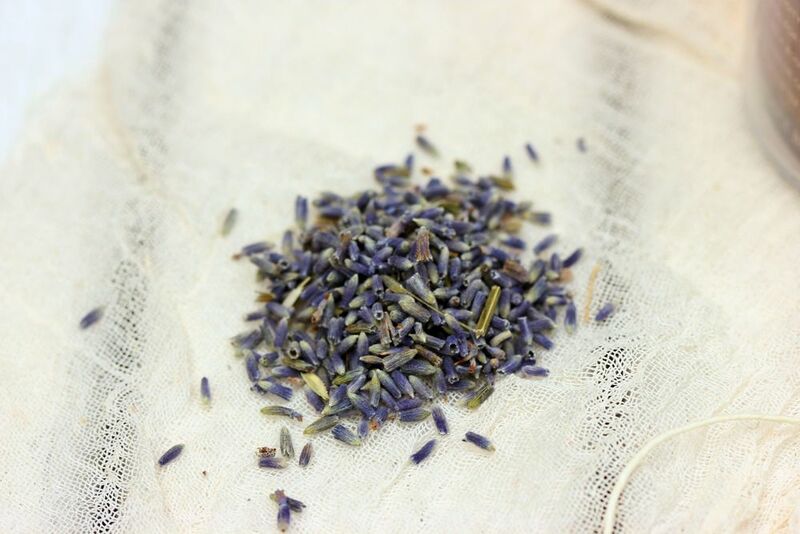 I tied it up into a muslin cloth and added it to the preserving pot. 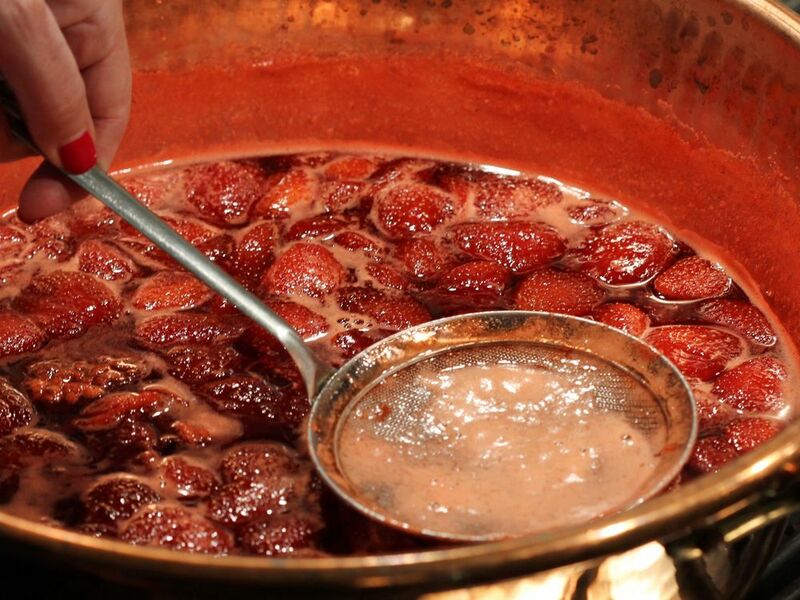 Bring the strawberries to a boil over high heat, lower the temp slightly and stir constantly to prevent sticking. The mixture should be kept at a constant boil. Continue cooking and stirring until the foam subsides and the mixture takes on a darker look. The bubbles will become smaller. Turn off heat and skim off foam. Return to heat and cook a bit more on a lower temperature, stirring constantly to prevent sticking. When it appears shiny and thickened, turn off heat, skim off any additional foam, and test for doneness. Remove one of the metal spoon from the freezer. Place some of the jam onto the spoon and return it to the freezer for about 3-4 minutes. Remove and check the thickness. It should run slowly. If it doesn't, return the mixture to the heat and cook a few minutes more, using your spoons to test it again. Remember that homemade jam isn't as stiff as commercial jam made with pectin. But it shouldn't be watery or runny either. Once the jam has thickened, pour it into sterilized jars, filling them 1/4" from the top. Wipe rims with a clean cloth and attach lids and rings. Set onto a baking sheet and into a 250F oven for at least 30 minutes. Remove and allow the jars to cool and sit undisturbed overnight for a proper seal. Store jars in a cool, dark place and refrigerate after opening. Rinse strawberries and remove their stems. Place in a large glass or other non-reactive bowl. Add sugar and lemon juice. Toss lightly. Cover and macerate in the refrigerator over night. Next day, transfer to your cooking pot. Place a saucer with 5 metal teaspoons into the freezer. Bring the strawberry mixture to a boil over high heat. Lower heat slightly, stir constantly to prevent sticking and continue cooking for approximately 20 minutes. Mixture should stay at a constant boil. When it begins to darken and take on a shinier look, remove from heat and skim off the white foam. Return to heat and cook at a lower temp for another 5 minutes, stirring to prevent sticking. Test for doneness by removing one of the metal spoons from the freezer. Add jam onto spoon and return to the freezer for about 3-4 minutes. Remove and test for proper consistency. It should run slowly and not be watery. If it is, return to heat and cook a few minutes more. Test again with another spoon. When ready, pour into clean jars, filling them 1/4" from the top. 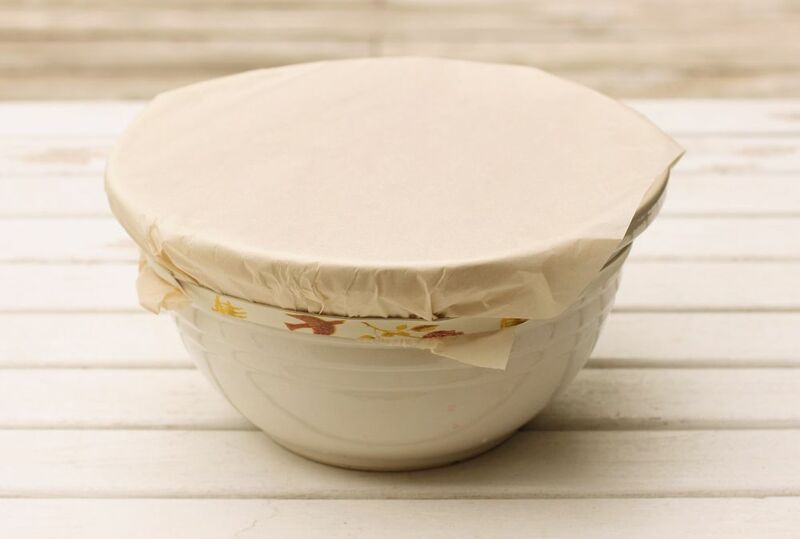 Wipe rims with a clean cloth and secure lids. Place sealed jars on a baking sheet and into a 250F preheated oven for 20 minutes. Remove and cool undisturbed overnight on a cooling rack. Keep for 6-8 months in a cool, dark place.